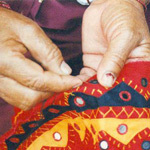 This craft is practised by the Banjara or nomadic tribal women also known as the Lambadis. The clothes are expressive of their exuberance, the entire ensemble being pieced together using gaily coloured fabrics, embellished with mirrors, glass beads, and cowrie shells. This craft is characterised by vibrant colours, fascinating combinations and exquisite embroidery. Products which showcase Banjara needle craft include bags, belts, batwas or purses, yokes, borders, salwar kameez suits, skirts, blouses, pillows, cushions, quilts, and bedspreads. 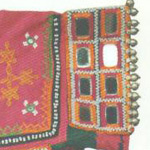 Drawing upon the traditions of the past, the embroidery of Banjara tribal women evokes a scintillating flight of fancy.